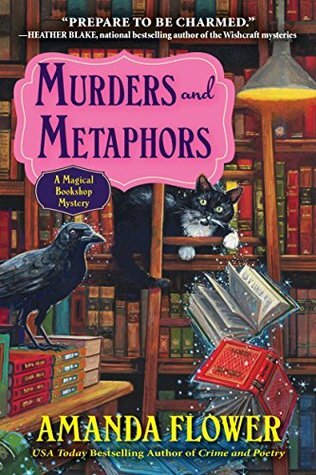 MURDERS AND METAPHORS BY AMANDA FLOWERS – Books, Books and More Books! In this third installment of the Magical Bookshop Series, we are back in Cascade Springs with Violet and Grandma Daisy of Charming Books. Where books magically match themselves to customers. January is time for the Ice Wine festivities and Violet is not feeling it this time. She’s had her heart-broken before and the one responsible is sure to be in attendance. Which means Violet will not be. No matter what. Not even magic is going to get her to go! However Grandma Daisy has arranged for the book shop to host former resident and current book writing sommelier, Belinda Perkins, book signing. Belinda left town long ago after a fight with her sisters. One of those sisters may be still carrying a grudge and after the throw down at the book signing, one of them is left dead! While Violet is almost certain sister Lacey is innocent, she herself turns to the magical bookshop for assistance. And as usual the help is spot on! But will it save Lacey or just leave them both out in the cold? This is such a fun series and Amanda Flowers is one of the best at cozy mysteries. I love Faulkner, the crow. The characters are very well written and it’s what I would call an intelligent cozy! Now that’s a book store I want. I really enjoy this series as well. Would love to visit this magical bookstore. Nice review Patty. Thanks. I enjoy it too!